Vinyl flooring is an alternative to wood flooring. This is a great option and is much cheaper then wood flooring. If you have a beach home in South Florida, then this would be a great choice for you. The water resistance on vinyl is just great for walking around your house after going to the beach. You would not have to worry as much about trekking water everywhere. There are also many great designs that you can choose from. The cost is simple and easy so you won’t need to worry about that too much. It does not provide the same feel as hardwood but has its own special feel. You wouldn’t really notice it unless you paid attention. It is not like a carpet at all. If anything it is closer to hardwood than anything else. Vinyl flooring is very comfortable for someone who just needs to put floors in their house with a good design and has a budget. Even without a budget this is still a good choice due to the nature of the vinyl in combination with the beach home. 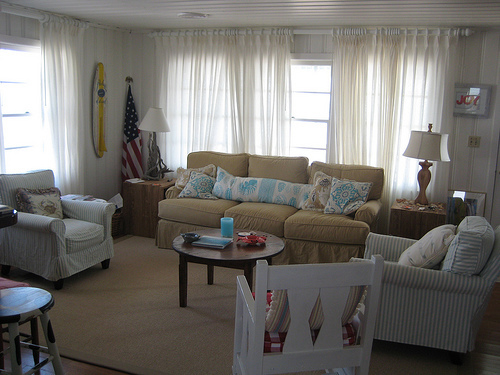 The very design of vinyl compliments beach homes due to their simplicity and look. They are great for cleaning up crumbs and spills because they are usually flat surfaces that do not absorb liquids as much as carpets or more delicate surfaces. The various designs are also more well decorated then a wood floor when it comes to styles. You can have vinyl tiles, simulated wood floors, simulated bamboo floors, or even a simulated metal floor is that was what you wanted. It is basically just a sheet with a design on it. The vinyl material does have its occasional weakness such as being able to be cut easily so it would be a good idea not to play with any knives right next to it but that is usually not an issue for most people. To best compliment a beach home in south Florida you could put a simulated wood floor, or even a simulated bamboo floor and it should give the house a nice, beach-like feeling.